Expansion, growth and access have been the buzzwords for Indian higher education in last five years. However, they all sounds hollow when you hear that some colleges in Delhi University expect 100% marks for admissions. 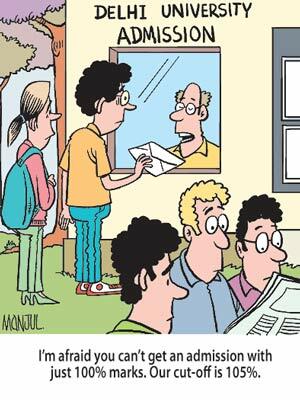 As this cartoon from Manjul shows, “aiming high” has a new standard. The talent pool aspiring for quality higher education is increasing at a much faster rate than number of institutions with quality. This means that more students with highly competitive academic preparedness are available, however, the institutions with high quality have not increased in the same proportion. According at a recent article in Times of India, number of students with over 95% marks in CBSE (XIIth grade) have shot up from about 1200 last year to over 2100 this year, while the number of undergraduate seats in the University of Delhi roughly the same as last year at 54,000. Instances like this, question the whole rhetoric that Indian higher education is reforming and expanding access. The reality seems that Indian higher education is regressing as the availability of quality institutions is unable to keep up with supply of talent pool. According to UGC, number of colleges in the India increased by 53% in five years to nearly 26,000 colleges in 2009. If this quantitative expansion of colleges had as significant qualitative element in it then students would have had more confidence in their choices to go beyond the “tried and tested” reputed brands. However, we have a situation of a crisis of confidence and hence many students with high academic ability are aiming for the same set of select few institutions with lowest career risks. While the private sector has contributed a lot in increasing the access to higher education, it has focused on “money-minting” professional programs in engineering and management and has often done it without much consideration to quality. This example reiterates the horror stories we have heard from highly selective IIT and IIM admissions that much still needs to be done in terms of instilling quality in Indian higher education and gaining the confidence of prospective students to explore beyond the select few. Previous Agents for international student recruitment: Have we not learned anything from Australia and the UK? There is no doubt that Indian Heigher education system is regressing because of lack of quality in many of the institutions. When the news about DU's 100% cut-off came out, I browsed the website of Swaraj University(www.swarajuniversity.org) which is a disruptive model in Indian Higher education- it has 0% cut-off with no tuition fee. It is a 180 degree shift from DU's model. I accept the fact that Indian institutes are growing like Mushrooms today..but on the other part I feel that the Government has started thinking abut recollect that respect of Indian education system that once was. There has been a lot of tie ups in last few years with the foreign Education systems (which are already known for quality)to streamline the quality focused processes in the Education sectors..